A week and a half ago we experienced an incredible 24 hrs. First, we found a small refrigerator on sale at about 50% of what the others here were charging. We went to purchase it for our home in Bewani. When we went to pay for it, they told us the price had been cut another 30%. Wow that was good news, since things are so expensive here! (We will have to get solar power to run it…) Then, that evening, a church member came to visit, and he imports fresh produce from the highlands to sell to the supermarket here. There is a very large mark up on the prices so we asked if he would sell to us direct. He said "No, but we wish to help this mission project, so we will give you the fresh veggies you request at no charge each time a shipment comes in"!! The next morning we went to see another church member about buying a very small gas stove/oven to use in Bewani, since there is no electricity there. When we got there, she said she had just called her boss in another city, and was told we could have the new stove/oven and a used kitchen sink we had requested, at no charge! She then said, I felt impressed to ask him about a vacant house the company owns here, to see if you could house sit it until you move out to Bewani. I told her I would like to see it, as I had no idea of what condition it might be in, since it was empty. We didn't know size, location or anything about it. She said, "I can show it to you at 3 p.m." We got back to our home, at the church a little after noon, and less than one-half hour later, the new pastor and his family arrived to live in the house with us. Everyone here had been told he had 3 small children. He arrived with four kids and two of them were teenagers! A family of 6, plus us, in a small house of about 700 sq ft was not going to work very well! Just then, the lady with the empty house showed up at the church and I asked her if we could go see the house then, instead of waiting until later. She agreed and took us to see it. This house in on top of a ravine overlooking jungle with the ocean not far away; we can see the beach, and hear the breakers all the time. The house is large, furnished, and in a good, quiet neighborhood. It is like a vacation home compared to what we have been in! She said we could stay in it until the end of April at no charge! We were moved and unpacked in less than 4 hours. The pastor and church leaders couldn't believe how God had provided a way out of a difficult situation just in time! During this same 24 hours, our plane was having the wings and tail removed by kind volunteers in Arizona. It is now waiting for a container for shipment to Guam. It will be flown from there to here! This week we received the promised veggies from the church member. Wow what a blessing to our table! FYI, we have managed to loose all those extra pounds we put on while in the States. We sure are enjoying the fresh veggies and potatoes! We still don't have a vehicle or a water tank for the house in Bewani, but in God's time it will all work out. We face many challenges and hurdles, but as we remember how God has led thus far, we know He will work it out as He sees fit. Thank you for your continued prayers and support. God is so faithful. His thoughts are not our thoughts and His ways are not our ways, but in His time and way, things always work out! 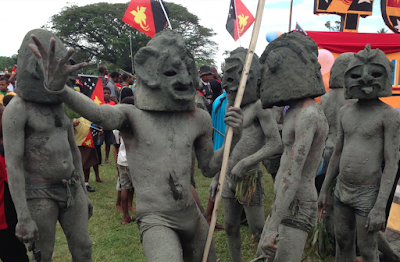 We have posted a new video from PNG on our blog site, (7 min. long).